Turkcell is a digital operator headquartered in Turkey, serving its customers with its unique portfolio of digital services along with voice, messaging, data and IPTV services on its mobile and fixed networks. Turkcell Group companies operate in 8 countries – Turkey, Ukraine, Belarus, Northern Cyprus, Germany, Azerbaijan, Kazakhstan, Moldova. Facebook & Instagram are big revenue drivers for us. StitcherAds has helped us increase ROI across both channels, while significantly decreasing cost per conversion compared to other sales campaigns. As a leading mobile phone operator, Turkcell has significant web traffic and a large audience of service subscribers. Despite this, they were struggling to build a retargeting strategy to recapture abandoners and improve ROAS on Facebook & Instagram. Turkcell wanted to find a better way to retarget and convert current users and website visitors to drive more mobile phone and accessory sales. Turkcell uses StitcherAds’ managed service offering, entrusting our team to build and execute Facebook marketing strategies. We built a dynamic retargeting strategy for Turkcell based on level of intent and recency of action taken. For optimized bidding and customized messaging, we divided products into groups by category and price point. With these new product sets, we were able to increase reach and conversions for high-end products. 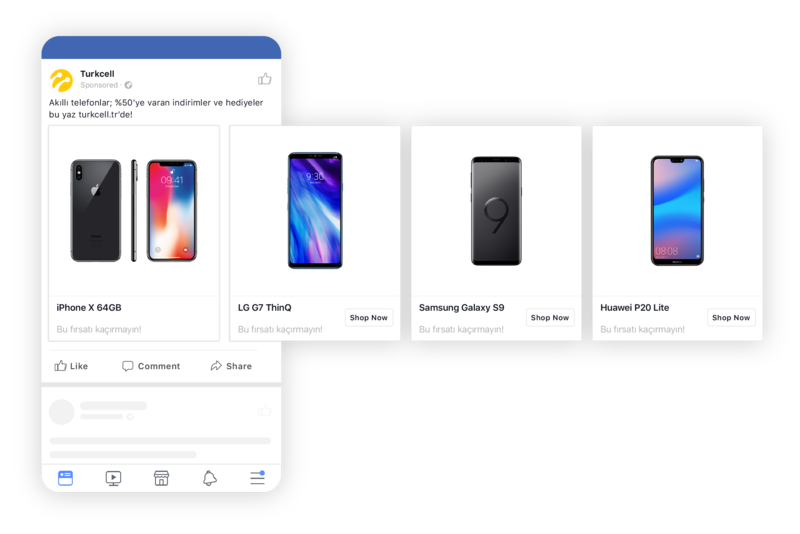 Using StitcherAds, Turkcell ran optimized dynamic product ads that drove 92% of their total sales on Facebook & Instagram for mobile phones and accessories. Compared to other direct response campaigns, these sales came at a 15% lower cost per purchase.